All Bar One brings you some of the finest city bars in the UK. Their stylish locations up and down the country are the perfect place to meet friends after work for a cheeky cocktail, or linger over a delicious dinner. 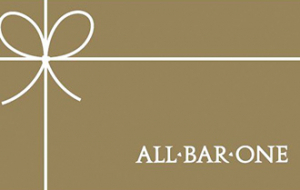 All Bar One offers a fresh, seasonal menu all year round with indulgent brunches, tasty lunches and sumptuous dinners. Treat your giftee to a meal for two with this gift card and enjoy the perfect setting for a proper catch up. This card may not be exchanged for cash. This card is not a cheque guarantee, credit, debit or charge card. No change will be given but the balance can be used for future purchases. We will not be held liable for lost or stolen cards - protect this as you would cash. To check the balance of your giftcard please visit www.allbarone.co.uk/giftcards A gift card is valid for 12 months from the date of purchase. This card is valid for use at All Bar One Bars only. Gift cards can be purchased with a minimum value of £10, up to a maximum of £250. SMS and email gift cards should be treated as cash. If deleted they will not be resent. SMS gift cards will be free to receive for the guest. Email gifts are valid either presented on a smart phone or printed out. We reserve the right to amend the terms and conditions. Further terms and conditions are available upon request.